The system is named Dream Factory because it is a facilitator for any gaming group to take the raw materials of creativity and imagination and produce refined gems of pure wondrous moments – unforgettable story experiences, moments of awe, and compelling heartfelt dramas. Fiction that feels not only as real as anything, but beyond that, rings meaningful and true. The story may be made up, but the journey is real – our made up characters bring us along for the ride, as the characters of The Neverending Story by Michael Ende would confirm. All that is well and good; however one may well ask what is it about the rules of Dream Factory that makes this work? Why should a group of friends use this particular game to elicit their stories? Dream Factory is based on a few key mechanics that are elegantly simple. So it’s not just easy to learn, but also has a system that stays out of your way until you need it. You spend more time story-telling and less time bogged down in rules, such as charts and tables, of which Dream Factory has none. Its a relatively short book — around 130 pages (with pages only 7” by 10”), not the three to five hundred pages (of 8½” by 11”) of most game systems. And well over half of this short book is devoted to matters such as helping those completely unfamiliar with RPGs as a whole, words of advice as to the nuances of the game, and several examples of playing the game itself. The core mechanic is a straight-forward and simple: as in most roleplaying games, one player runs the game (the Gamemaster, or GM) while the others (the players) invent fictional characters they portray within the imaginary world of the GM’s setting. The group narrates what is going on, with the players announcing their characters’ actions in the context of an ever-evolving world that the GM continues to relate. Sooner or later the story comes to a dramatic fork, where events could turn one way or another. The players pick which outcomes they are going for, and make an Outcome Check — using a few basic six-sided dice. If they beat the GM, they get what they chose; but if not, the GM gets to make the choice — usually a choice for more drama for the player’s character’s lives, or even possibly some kind of setback. When players win an Outcome Check, they consume resources — resources that are acquired by the GM. But when players lose an Outcome Check, not only do they keep their resources but they gain whatever resources the GM spent. The consequences are elegant. Every time someone wins an Outcome Check, the chance for them to win following Outcome Checks decreases. Likewise, every time someone loses an Outcome Check, the chance for them to win following Outcome Checks goes up. The more you win, the more you will wind up failing next time — and vice versa. This applies equally to the players and the GM. This creates an exquisitely self-balancing system where narrative power naturally flows from the players to the GM and back again many times over the course of the game session. Unlike some games, in Dream Factory it doesn’t matter if you play for one hour or ten, the narrative balance attends to itself. The game was also designed to have only what is needed. Each character has four stats that each player gets to pick themselves. There are no numbers — you either have a stat or you don’t. Your character can be “Good with his hands” for example, but never will have levels or skill ratings. There are several additional facets of Dream Factory that together help make it the amazing game it is: Quandaries, Lynchpins, Safeties, and the Game Plan to name a few. Quandaries are the roadblocks in each specific player’s character’s way — like feelings of vengeance, or being wanted by the law — or even character flaws like alcoholism. When a player allows their character’s Quandary to generate drama they earn special Karma points that players can use to add to their chance of winning Outcome Checks. Each player character (PC) will have their own distinct Quandaries. Lynchpins are game-wide — and every game has two of them. Their function is to encourage and incentivize certain kinds of play by rewarding players who embrace them. Every game is different, and choosing the right two Lynchpins will makes a tense scary zombie game feel very different from a light-hearted action-adventure romp. Safeties are there to make sure that the narrative stays within each player’s comfort zone, whatever that may be. Whether the game your group wants is PG rated or R-rated (or beyond), specifying the boundaries of allowable storytelling ahead of time makes sure that everyone’s happy and that no one finds the resulting story unbearable. Finally, Dream Factory has something called the Game Plan — which is basically a character sheet for the game itself, specifying not just Lynchpins and Safeties, but things like genre, mood, setting, and more. Most of all, the entire fabric of the game is built on and prioritizes collaboration — not just among the players, but between the players and the GM. Although in many other RPG systems the GM’s role is to compete with or antagonize the players, that is certainly not the case here. The GM is fundamentally on the players’ side, facilitating the story of the player’s character, creating roadblocks only so that they can be overcome — to ultimately help the players discover and give voice to the stories they seek. You can go from zero to sixty in just minutes. Setup is so easy and fast that you can be gaming within five to fifteen minutes of sitting down to play, even when starting from scratch! With Dream Factory’s baked in spirit of collaboration and the chosen Safeties, you can relax and enjoy the drama, knowing that it won’t be taken too far. With its rules-light approach, you can spend almost all of your focus on creating the story itself, not on math or charts because there aren’t any! And since the system itself is setting agnostic, with the right choice of Lynchpins to shape the game experience you can explore any story you can conceive from slapstick to gritty, from epic to personal, from historical to futuristic! 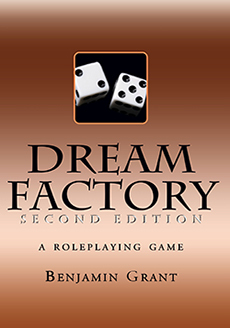 Dream Factory has everything you need in a roleplaying game and nothing you don’t. Even if you are new to running or playing RPGs, have no fear — players and GMs have a chapter each, with guidance and advice on how to get the most out of this game. And should you ever feel lost, the combination Glossary and Index will not only explain in simple terms the key concepts of the game (and RPGs in general), but each listing links back to the specific sections of the gamebook that cover each concept. Dream Factory aims to be the roleplaying game worthy of your imagination. Give it a try, and see for yourself! Click HERE to download the FREE excerpt! Click HERE to purchase the e-book, softcover, or hardcover! Furnish the author proof of purchase of a print version and get the e-book for free!